In recent years, much debate and a significant amount of controversy have surrounded the advent of third-party international student pathway programs in the US higher education marketplace. The debate is particularly active in international educator circles and was a hot topic at the NAFSA annual conference this year, with at least four sessions devoted to the theme, including a study commissioned by NAFSA itself. Different definitions aside, the controversy has focused on pathway programs that replace a university’s freshman year in a revenue-share model that delivers a combination of ESL instruction and academic courses to international students. The key driver behind these third-party pathway agreements is the promise of international student recruitment to the host institution. Typically, these pathway models are characterized by long-term contracts of between 10 to 30 years, venture financing, revenue sharing, academics concurrent with ESL study, and sometimes even the construction of a new building on campus. Most importantly, however, they are characterized by international student recruitment services. To distinguish this model from the others, let’s call it a “bundled pathway” program. In the context of financially strapped universities with decreasing domestic enrollments, the prospect of large numbers of international students paying out-of-state tuition rates makes the bundled pathway an attractive proposition. Add to this the third party’s offer to finance the pathway venture upfront and the perception that this is all incremental revenue the university wouldn’t otherwise achieve on its own, and you have a very enticing package. In any transaction, however, each party fears “leaving money on the table,” and in the case of the pathway partnership model, the university is often left wondering whether that incremental revenue is truly otherwise unobtainable without the bundled pathway. Isn’t there a way a university might have its proverbial international student revenue cake and eat it too? To answer this question, we need to address some of the assumptions being made by a university when it is considering a pathway program. These might include notions such as that the academic model behind a pathway program is in high demand by international students, that a university can’t conduct sufficient international student recruitment on its own, that sufficient financing is unavailable, or perhaps more importantly, that there are simply no alternatives to the bundled pathway. One of the more controversial components of bundled pathways is that they often lower academic GPA admissions standards, which is done to cast a wider net for the bundled pathway joint venture with the hope of increasing enrolments. But, what we’re seeing and hearing from education agencies and international students is that an overwhelming proportion of students don’t want any part of a combined academic – ESL pathway program. Instead, they want to be assimilated, integrated, and to follow the same academic progression as domestic students. The bundled pathway is cleverly designed to meet the profit requirements of a business, while simultaneously purporting to fill an academic need. At the end of the day, it’s supposed to deliver a financial “win-win” for a university and a contracted third party that specializes in delivering international student recruitment services. One increasingly important criterion for the success of any pathway program is how attractive and well ranked the university it’s associated with is. This is a key maxim that, if ignored by a pathway provider, can mean the difference between success and failure in the increasingly crowded international student recruitment market. The fact that a bundled pathways program can accommodate students who have the finances to study overseas but not the academic level may also be a slight competitive advantage (of course, how many of these students progress successfully after pathway completion is another matter). That the pathway is marketed as the principal path to admission for international students is another critical factor in its success. Rankings aside, the main motivation behind the bundled pathway model from a university perspective is the international student recruitment services component, because it’s understood to be the hardest to duplicate. International student recruitment is costly, and the economies of scale obtained by third-party pathway providers working with a portfolio of universities are difficult to emulate. Furthermore, recruitment has been made to seem more inaccessible and challenging as a result of the controversies and fears surrounding the engagement of recruitment agencies and their incentive-based commission models. Nevertheless, times are changing, and several studies, including those carried out by Bridge Education Group, and more recently by the American Council on Education, indicate the engagement of agents by US universities is on the upswing, with as many as 45% of universities now engaging their services — some directly, and others through private sector intermediaries. Increasingly, as revealed in the American Council on Education report, universities are taking charge of, and investing in, their own internationalization strategies. They may be doing this because they’re being ignored by bundled pathway providers, because they’re a “hard sell” (not ranked, not in an urban hub, few STEM programs), because they’ve already achieved some momentum of their own and feel emboldened to do so, or because they’re suffering from a severe case of FOMO (fear of missing out). The expectation is that current or future funding for recruitment can be obtained from a percentage of international student tuition revenue, in much the same way it would be paid out to the bundled pathway provider in a joint venture. As to the notion of the unbundling of bundled pathways, more and more universities are asking for support services “a la carte,” according to their specific needs. 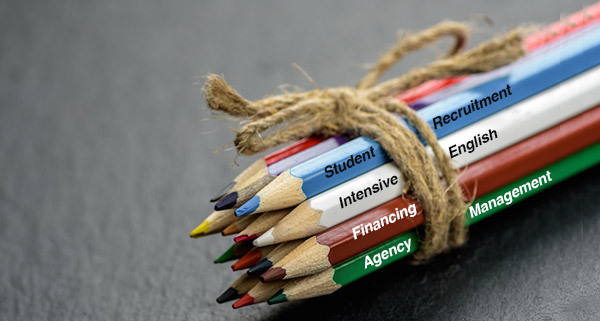 These services may focus on assistance with agent management services, international alumni outreach, international university partnerships, digital marketing services, collateral localization, strategic studies, recruitment for a particular program or from a specific market, or augmentation of other university initiatives. In choosing only the required services, universities meet their overarching desire not to replace their intensive English program or to have their IEP enrolments cannibalized by a competing pathway program on campus. As one might expect, the market is answering this and other calls for assistance with an increasing number of consulting providers offering a menu of these a la carte services. No bundle required. There’s no question that private sector providers can play a big role in the future, or that universities need their assistance. What we’re facing is a normal market evolution, characterized by increased competition, awareness, and market intelligence. This evolution is forging new models — in this case, an unbundled model. Does it make sense to sign a 15+ year contract, locking into a rigid business model in a marketplace that’s getting disrupted in five-year cycles? Perhaps, counterintuitively, this principle holds true for both parties, the pathway provider and the university alike. While we sort through the converging noise of industry cycles and geopolitics, we can always rest assured that in our knowledge economy, expertise is often short-lived, business models are easily replicated, and with those shifts come new providers and models. The suggestion here is that this may be the case for the bundled pathway, and if so, that many universities will in fact get to have their cake and eat it too. Learn more about the services Bridge GlobalEd can provide to universities, including agent management, international marketing, Higher Education roadshows, and Intensive English Programs.